This is a piece that was commissioned by a wife for her husband. He has an extensive collection of 78rpm records and wanted to record them to CD format. 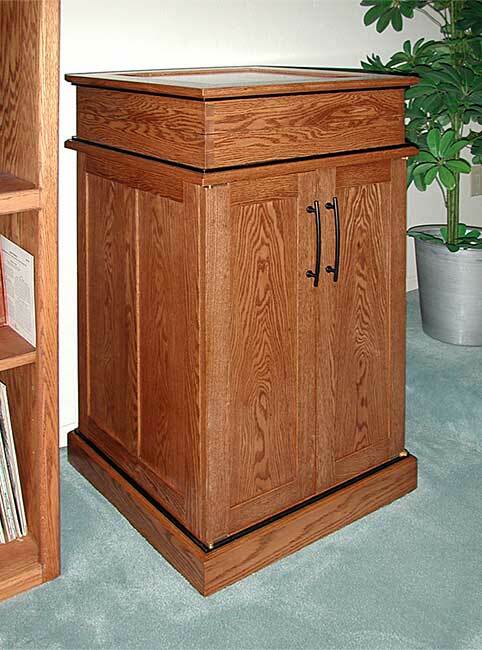 This cabinet is designed so he can sit in front of the cabinet and reach all the audio components. Most of the furniture in their house is oak (you can see some shelves to the left). I admit I'm not a big fan of oak and I really wanted to avoid the California modern look (like the shelves) so I came up with this more traditional frame and panel design. I had to add the black accents to mess with tradition. Oak, oak veneered plywood (shelves only), maple (stained black), shellac finish.